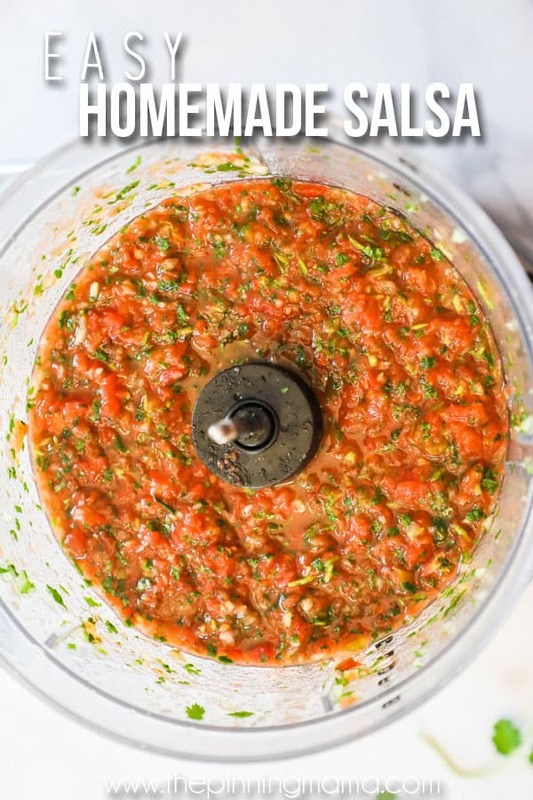 Homemade salsa is so easy, and taste so much better. You only need a few minutes and a couple of ingredients to make a small sized amount or enough to feed a whole crowd. This salsa is made with canned tomatoes to keep it simple and easy. You add fresh onion, cilantro, and lime so that is tastes delicious and fresh! Add this salsa to the top of any dish and you will not be disappointed. Taco night just got better. 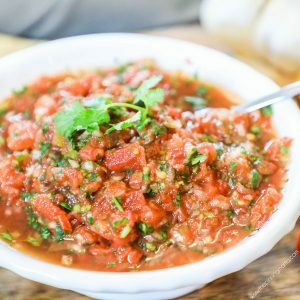 Everyone has their own salsa recipe, but trust me when I say this one is delicious, quick and easy. I made this the other morning in less than 10 minutes for a church party. I left with no leftovers but that is a good sign in my book. I never really thought of sharing it, because I just whip it up for dinner or lunches all the time. My friends begged and begged for me to share. I decided I needed to make a post about it so I can share with all of you. This homemade salsa is pretty basic. There are so many great salsa recipes out there, and all of them are a little bit different. This one is my go to recipe because it is so delicious and I almost always have everything on hand for it. With the use of fresh ingredients and canned ingredients, you are able to trick your mouth into thinking it took hours and hours to peeling tomatoes! When in reality it only took me 10 minutes. I am going to share with you some of my tips and tricks and hopefully answer any questions you have. You can find the FULL recipes card at the bottom of this post. Q: Is this salsa spicy? A: This is no a very spicy salsa by default. I would say this is mild, unless you use medium spicy ROTEL. My kids are a little sensitive to spicy food and neither of them have said its spicy. I usually turn around and it’s all gone. You can increase the spiciness by adding a diced jalapeño in the first step. Q: What herbs are traditionally in salsa? A: Salsa’s usually have jalapeño, garlic, lime, and salt added. It is very important in my recipe to use fresh cilantro because the flavor is not as strong in dried cilantro. Fresh cilantro is a must to the great flavor in this recipe. I use garlic powder in this recipe for convenience, you could use fresh garlic if you’d like. The fresh lime is also a very important ingredient. Q: Do I need any special equipment to make Whole30 Salsa? A: You will need a food processor or blender for this salsa. I prefer my food processor with the chopping blade, but a blender would work just fine too. If using a blender, you will need to add a bit more juice in the first step so I would add a little liquid from the canned tomatoes. Q: How do I make this into a big batch of Whole30 Salsa? A: You can double this recipe, but I would go bigger than that for the batch because most food processors will not fit more than that. You can make more than enough to feed a big crowd, or freeze it to have extra on hand next time you crave salsa. You can also cut the recipe in half if you just want a small amount. Q: How do I store the Whole30 Salsa? A: You can store this Whole30 salsa in a tight fitting container in the fridge for up to 5-7 days. Q: Can I freeze Whole30 Salsa? A: YES! I totally recommend doing this so you can have extra salsa on hand whenever you need it. To freeze salsa, I recommend placing it in smaller portion sized tightly closing containers. Then store in the freezer for up to two months. To thaw, place the container in the refrigerator 24 hours before serving. I really hope that your family likes this salsa as much as we do! It is a staple in our kitchen year round.